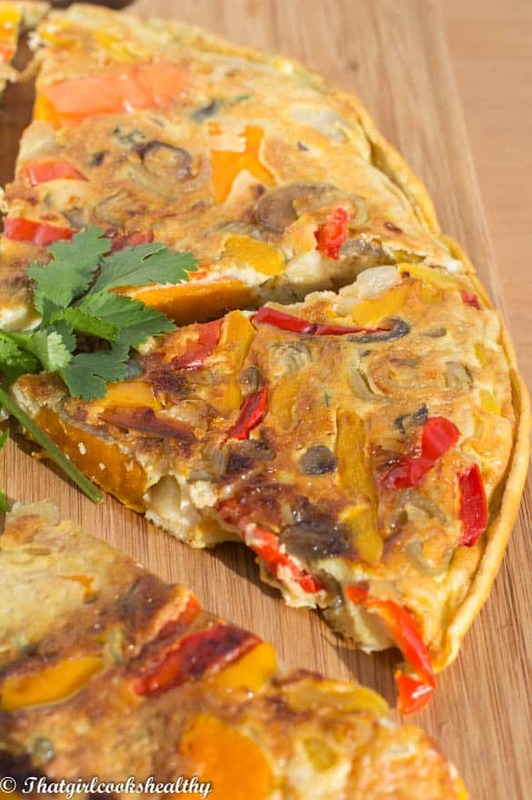 Sweet potato omelette recipe – this is my paleo rendition of Spanish omelette, using sweet potatoes in place of regular ones with shallots and added herbs. Anyway, as much as I love spending quality time in my kitchen I know other people may feel differently. That’s when those accessible go-to meals that aren’t a smoothie or oatmeal come in handy. 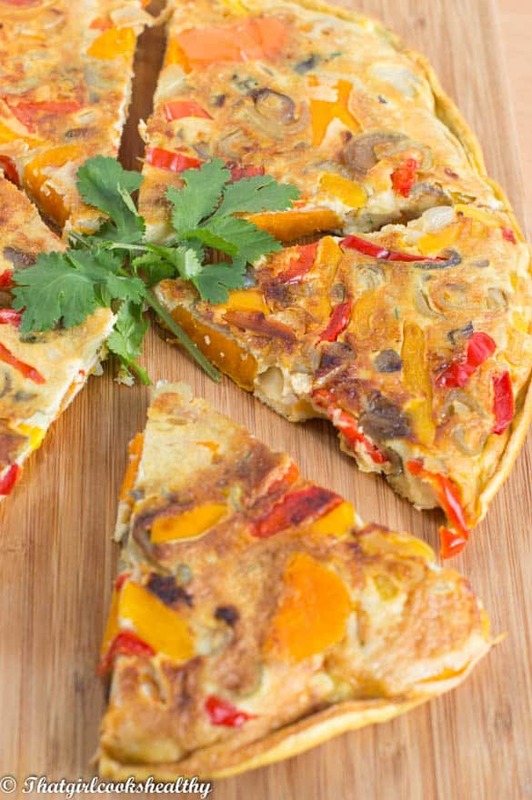 What is a Spanish omelette? An open omelette that derives from Spain consisting of eggs, potatoes and sometimes onions. This cuisine in Spanish is known by several names including tortilla de patatas, tortilla espanola, tortilla de papas. The word tortilla distinguishes it’s thickness from an ordinary omelette. 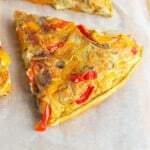 My Spanish inspired omelette is an overhaul, a revamp if you will of the original recipe. Firstly, the most obvious adjustment is the choice of potato being sweet potato rather than white potato. Now you’ll notice that I don’t and won’t (I never say never) feature white potatoes in my recipes because this is a true reflection of my food habits. White potatoes (albeit a fibrous carbohydrate) stimulates insulin levels at an astronomical rate incomparsion to sweet potatoes and presently more people are gravitating towards sweet potatoes because of it’s nutritional properties and it’s considered a clean starchy vegetables. This also make sweet potato omelette paleo by default – yay!! What to put in a sweet potato omelette? 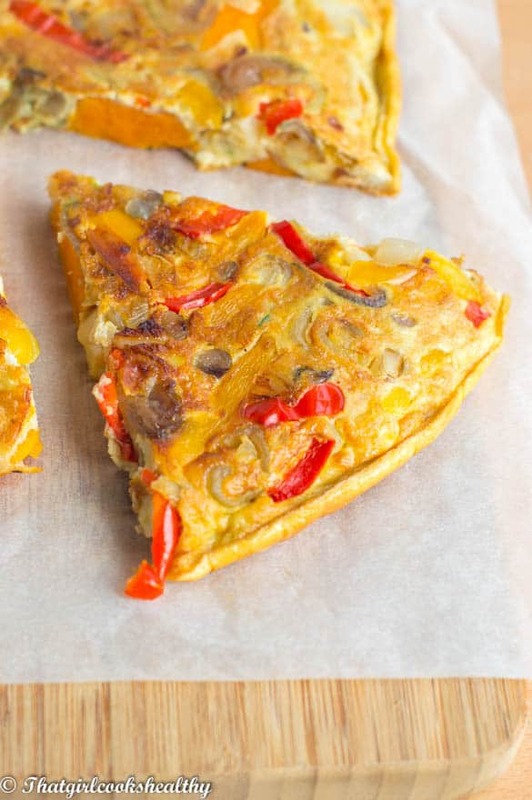 This is where the fun begins, since we are not following the traditional recipe and only taking inspiration from a Spanish tortilla , you can add any vegetable that you wish. Being a herb and spice freak it doesn’t take much for Charla to find a way to sneak in a few herbs here and there and create a tasty omelette. I took the liberty to add some bell peppers, shallots, coriander and parsley. Omelette density – The thickness of the omelette is varied according to the number of additional (if any) veggies and egg quantity. Since the eggs are responsible for forming the structure of the omelette, the more eggs used the thicker the tortilla, so keep that in mind. 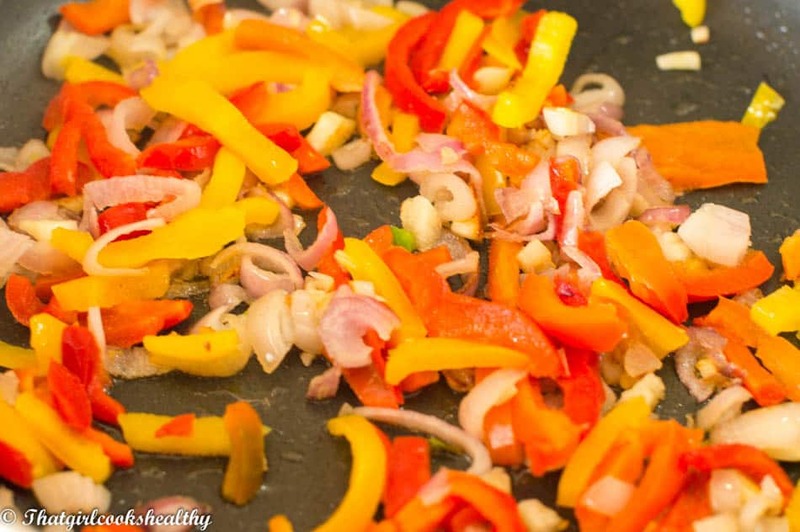 Adding your veggies – I figured bell peppers would not only add some colour but also contribute to our insoluble fiber intake and the herbs – coriander and parsley would enhance the taste by 10 fold (and it certainly did). As I said before, add whatever vegetables you wish here. Cooking both sides of the omelette – Might I add another handy tip for flipping over the tortilla, actually scrap that. When I cooked the first side, rather than toss the darn thing over, I placed the pan under the grill and cooked the top half. It’s so much more simpler and hassle free. There is another method you can use if you’re unwilling to try the above, that is toss the omelette over onto a large plate and slide it back into the frying pan (the plate and slide method). However, In order to successfully administer that step you’d need to ensure the omelette is firm and thoroughly cooked through to prevent the whole thing collapsing on itself or the eggs running onto the pan – formation is so key with this step. Can I cook sweet potato omelette in the oven? Yes you can. Once you’ve boiled the potatoes and sauteed the onions. After you have beaten the eggs and have your tortilla mix ready. Simply pour the egg mixture into a baking mould and cook until the top is golden brown. This should take roughly 15-20 minutes. Can I freeze sweet potato omelette? I wouldn’t advise freezing any omelette because the texture upon thawing out would change. I don’t think an omelette freezes well. Alternatively you can store an omelette in the refrigerator for upto 72 hours. 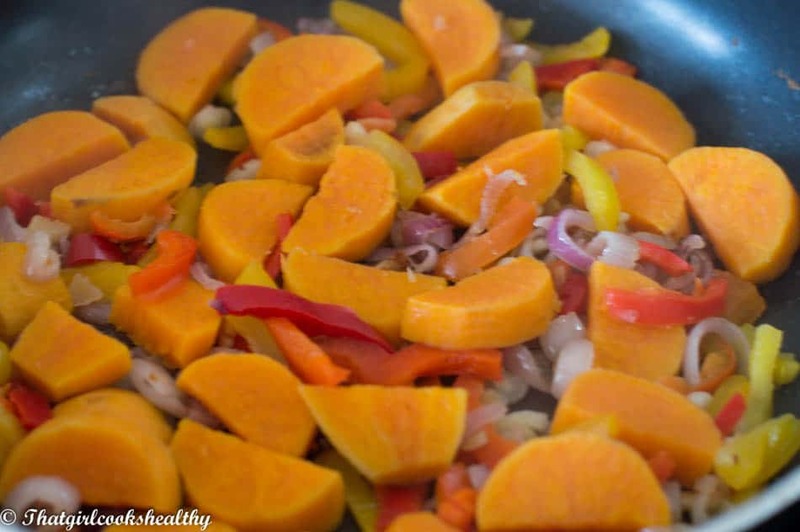 Add the sweet potato to a saucepan of water on high heat and reduce once boiled. Allow the potatoes to simmer for 8-10 minutes until tender. They won’t be fried so tenderness is important in the initial stages. Next, sauté the shallots with the bell peppers on medium heat for 1 minute in a large heavy duty fraying pan. We want both to soften only not brown so stir throughout and move quickly. Once the potatoes are ready, drain off the excess water and transfer to the frying pan. Beat the eggs in a bowl with the herbs, white pepper and pink salt. Arrange the potatoes, bell peppers and shallots evenly in the pan being careful not to overcrowd. Pour the eggs onto the other ingredients, distributing evenly. Cook the first side of the omelette until slightly brown, lift the side of the omelette to determine its readiness. Either toss the omelette over using the plate and slide method (see post) or my preferred method of cooking the top using the grill. Either way cook the other side until golden brown. I love sweet potatoes, this is a great way to include them in a nice omelette. I know right, I hope you get to try this soon. Another beautifully presented meal Charlene. I also loved the commentary – I must admit I am guilty of just treating food as a ‘basic biological necessity’ when life gets busy! I actually made an omelette similar to this one today, but I like your idea of bell peppers and sweet potato – so colorful! Thanks Jolie, I had a feeling you would ahead over to my blog and comment on this specific recipe. I hope you get a chance to try my rendition of Tortilla de Patatas. Thanks for pointing that out Seth. No it’s vegetarian not vegan I mislabelled the recipe with the wrong tag but corrected it since.